No. You aren't crazy, I was trying to post this link to a linky party and posted the wrong picture. Since links can't be duplicated, I had to redo this post. Sorry! I must confess that I have already started working on My Kiddo's Easter basket. As a Christian, Easter has a very special meaning to me and is the absolute defining factor of my faith. I get easily discouraged trying to find things to go inside an Easter basket that relay the meaning of this very special holiday. So, I decided that this year I would embark on an Easter Basket Re-Label Mission using items already found in stores. Over the next few weeks, I will be posting these ideas and many free-printables for those who would like to try this too. It just seems like this route would be the most cost-effective way, rather than ordering a bunch of specialty items that will probably put me spending way more than I wanted to. So, here is the first item: Peeps! They are one of the staples at this time of year and pretty much every store sells them. 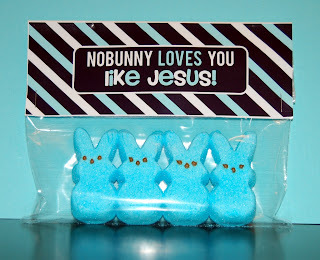 I labeled them "Nobunny Loves You Like Jesus". I made two different variations of this bag topper to coordinate with blue or pink peeps. My topper is sized 7 inches wide (because that is the size ziploc baggie I had), but you can leave more trim or shave off the sides to accommodate different bag sizes. Just print of the printable (there are two per sheet) and fold over ziploc bag and staple on sides. 29 more Facebook "likes" till we can launch or Silhouette Contest folks! I really want to give this away so badly, so please be sure to tell all your friends about "Detail-Oriented Diva"! Love this idea!!! 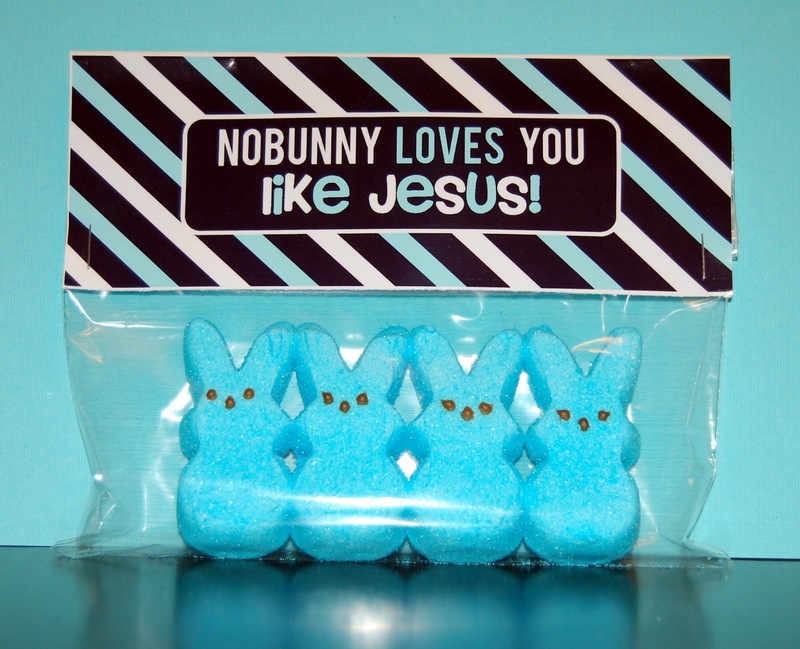 These are going in my grandkids Easter baskets. I love this!! Thinking of using this for my Sunday School class this week! How do you print them? I'm having trouble. Make sure you are clicking on the link above the picture. That will take you to box.com where you can download it. Thanks! Hi, your blog really touches me, have been reading it for awhile... Just wanted you to know about a website i started ReadYourBiblesChurch.com... It's a place for Bible study guides.. I also put a forum in that can be viewed from a mobile device.. I couldn't find where to contact you privately so I'm commenting, hope that is okay. :) God Bless! Jenn. So glad that you find what I have to say meaningful! Sometimes,I feel like I am just talking to the walls. What an great organized way to learn about the Bible on your site. Thanks so much for taking the time out to tell me about your new site. I am your newest Facebook fan! You are totally right about the contact info, I thought I had made it clearly visible. Thanks for bringing it to my attention, I will be fixing that.